Two tuning forks having frequencies of 460 and 464 Hz are struck simultaneously. What average frequency will you hear, and what will the beat frequency be? This is College Physics Answers with Shaun Dychko. The average frequency of these two tuning forks is 460 Hertz plus 464 Hertz divided by two and the average will be halfway between them which is 462 Hertz. Now, this is the frequency that you'll hear, although the human ears are a bit special depending on how you perceive sounds, you might distinguish two different sounds instead. Yeah, so human hearing can be complicated. 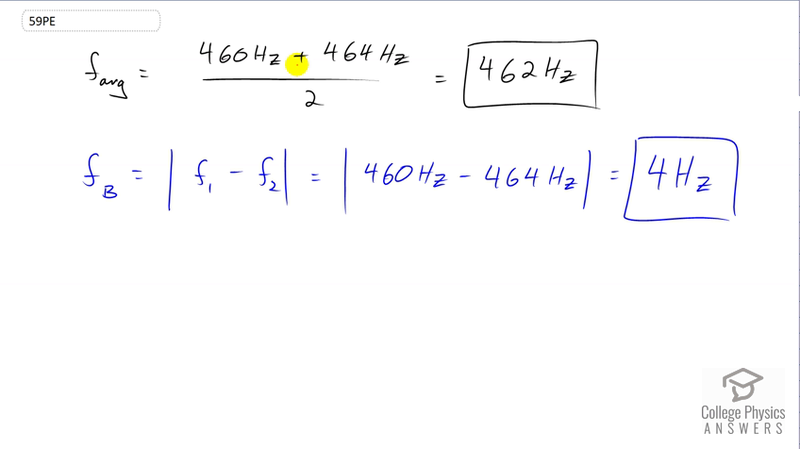 Now the beat frequency will be the absolute value of the difference between the two and so that's the absolute value of 460 Hertz minus 464 Hertz which is the beat frequency of four Hertz. So this is the frequency at which you will perceive a changing in amplitude of the combined sounds.